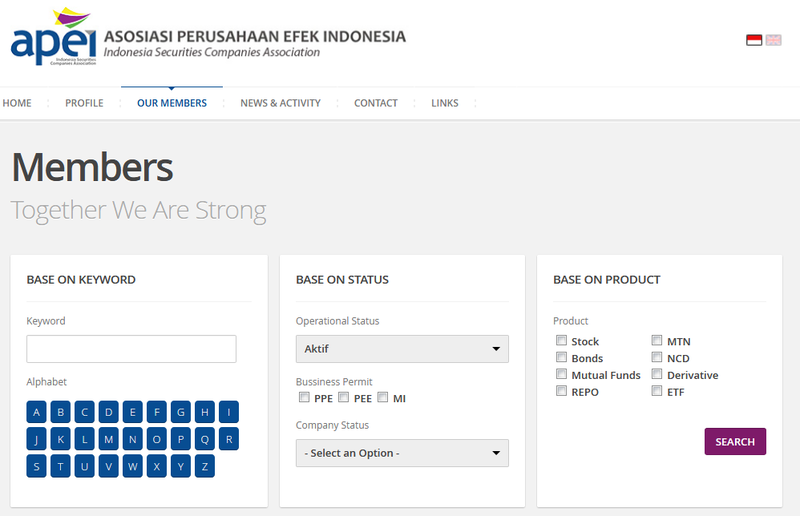 Indonesia Securities Companies Association (APEI) --> LINK <-- was established by a number of directors of Securities Companies to support the national development and to maintain the sustainability of national economy for a developed and advanced Indonesia capital markets. APEI is the merged form of a number of associations - individuals and companies - in the Indonesia capital markets. The merger of the associations was completed after a number of meetings, especially the meeting on 4 November 1995 at Shangri-La Hotel, Jakarta. As a result of the meeting, on 4 November 1995, in the meeting room of the Capital Market Supervisory Agency (BAPEPAM), witnessed by the Chairman of BAPEPAM, a Memorandum of Agreement was signed among Indonesia Securities Companies Association, Indonesia Underwriters Association, and Indonesia Investment Managers Association to merge the associations into a body named Indonesia Securities Companies Association or ASPERINDO, which subsequently changed to APEI. At present, the number of APEI members is 126 Securities Companies. The development of nation and state through the development of Indonesia capital markets. To develop healthy and strong securities industry.